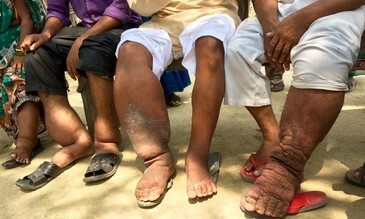 Lymphatic filariasis (LF) affects 40 million individuals in 73 countries stretching from Africa to Asia. LF is an infection caused mainly by the filarial worms Wucheria bancrofti and Brugia malayi. It is transmitted to humans by the bite of infected mosquitoes and can lead to permanent disability from grossly disfigured limbs with thickened, hardened skin (lymphoedema, elephantiasis) and swollen scrotum (hydrocele). Those with severe symptoms are often unable to work and may suffer significant social stigma as a result of their disfigurement and may be shunned by those in their communities. In 2000, the World Health Organization (WHO) launched the Global Program to Eliminate Lymphatic Filariasis (GPELF) which has delivered drugs to treat and prevent this infection. From 2000 to 2015, 6.2 billion treatments were delivered to 820 million people. In the next few years, approximately 40 countries will have approached the elimination point. New diagnostics will be needed for surveillance programs that will be conducted over 5 years to ensure that there are no hidden reservoirs of infection. The only proven field-deployable test for lymphatic filariasis currently is the immunochromatography testcard (ICT), that has been used for 2 decades to detect active infections. However, the ICT card is not suited for surveillance activities, as it detects the disease only 18 months after a person has been infected and lacks sensitivity in post-mass drug administration settings (due to low parasite burden). Experts agree that what is required for surveillance is a RDT indicative of early exposure to W. bancrofti infective larvae. A collaboration with the Task Force for Global Health and the Centers for Disease Control and Prevention (CDC) has allowed us to generate preliminary data that demonstrates that we can deliver such a tool. The combination of sensitivity, portability, and capacity for early detection of recrudescence will make our RDT an optimal tool for lymphatic filariasis surveillance programs.